Having an above-ground pool is surely as enjoyable as having an in-ground pool but its not as easy to find maintenance equipment and supplies for it. Materials used for above-ground pools are mostly not compatible with in-ground pool cleaners. Thankfully, technology is on your side on this one too. Innovation and evolution of pool cleaning paved the rise of automatic vacuum pool cleaners. If you're considering getting one, then you should read on about the Polaris 65 pool vacuum cleaner. It's probably one of the best pool vacuum cleaners there is out there - plus, it's affordable too! Let us tell you more about it! 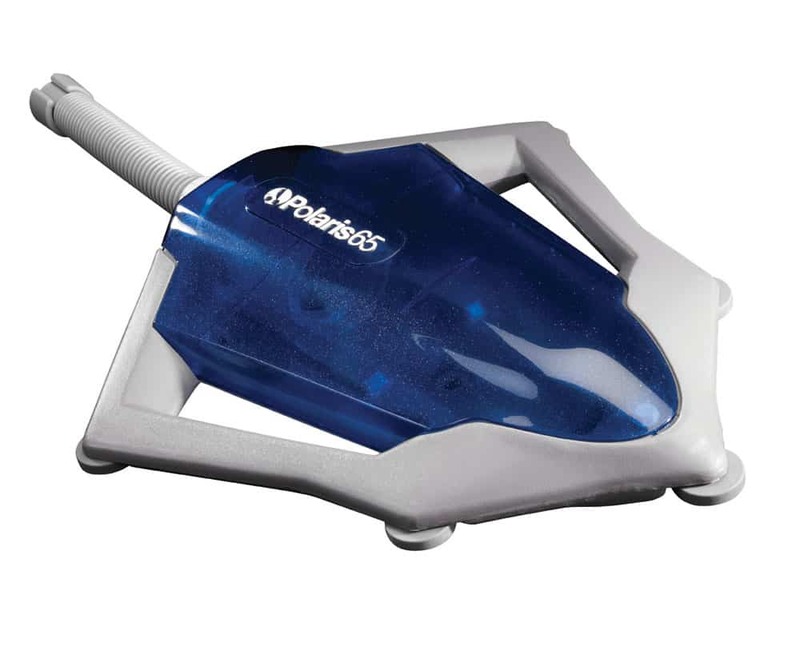 The Polaris Vac-Sweep 65 is a pressure side pool cleaner that's specifically built for above-ground pools that are made of vinyl or fiberglass. It can even clean pools that have uneven bottoms to a depth of 5 feet. You can also install it in a matter of minutes so imagine how easy it is to operate this pool vacuum cleaner. It is also equipped with a 1.5-inch threaded return line and 24 feet of float hose which is just enough for pools up to 24-feet round. the pool floor to loosen debris and dirt stuck in various areas of the pool. The easy-to-remove filter bag will then pick-up the debris loosened at the bottom. Since this is powered by the pressure of clean water that's returning to your pool, you save a lot of energy and water during the cleaning cycle. That also means you save money by doing so! As the cleaner works using the pressure side of your pool's pump, it helps distribute the filtered and treated water throughout your swimming pool as it cleans. This action leaves both the filter and pool skimmer free of contaminants that can compromise the durability of the skimmer. This is important because filters and skimmers take care of the pool's pump efficiency and service life. The Polaris 65 is designed to provide a healthier pool, reduce the maintenance of your filter cleaning up to 80% per year and maximizes circulation and heating by returning clean and filtered water throughout all areas of the pool. The Polaris 65's unique filter bag removes debris before it reaches your pool's pump basket or filter. Again, this is beneficial to both you and your pool because you won't have to suffer from filtration system repairs now and then! If your pool catches all kinds of debris - from the smallest and finest one up to the larger ones like leaves, the detachable debris bag can even trap up large debris. Polaris 65 does not have an actual vacuum to engulf debris or a brush to scrub the floors of the pool. The machine only deploys its skimmer net at the bottom of the pool and it collects dirt and debris that is removed by its powerful jets. ​Discover World's Best Robotic Pool Cleaners On This ​Post. How do I prevent my float hose from tangling? Like most of the vacuum cleaners with a float hose, there is a possibility that it could tangle itself up while cleaning. The best way you can prevent it is to lay the float hose out straight in the ground to remove the coils and check the float hose length. It's essential to attach the segments based on what is needed, and not bring out too much to prevent the coiling. Will this product work with the 24-feet float line? From the return fitting closest to the center of your pool, this hose must reach a distance of 4 feet from your pool wall. If you have a pool with a diameter of 30 ft., this cleaner will not work. You can opt to choose other Polaris products which are designed for pools with 24-feet float line. Do I need to purchase anything else before I could use this or is this really a "plug-and-play" device? Yes! Everything you will need for efficient and effective pool cleaning is included in the initial purchase. However, you might have to clean the Polaris 65 net regularly or opt to replace it with a Polaris All-Purpose Bag or a Polaris Leaf Bag as necessary. The most attractive thing with Polaris 65 is that it's actually pretty easy to use. With its plug-and-play mechanism, you'll be sure to clean out your pool in no time! It works fast, too as it can clean your pool in just about 3 hours. So that means you don't have to lounge all day, waiting for your pool to be cleaned. Overall, the Polaris 65 is a good buy! All you have to ensure is you set it up properly and take the necessary precautions when it comes to the hoses so that it doesn't entangle itself to ensure smooth operation of this device.